Hey… it’s Valentine’s Eve. Is that a thing? Maybe you have totally forgotten about this heart-filled day but suddenly realized your kid needs to bring some valentine’s for a class? 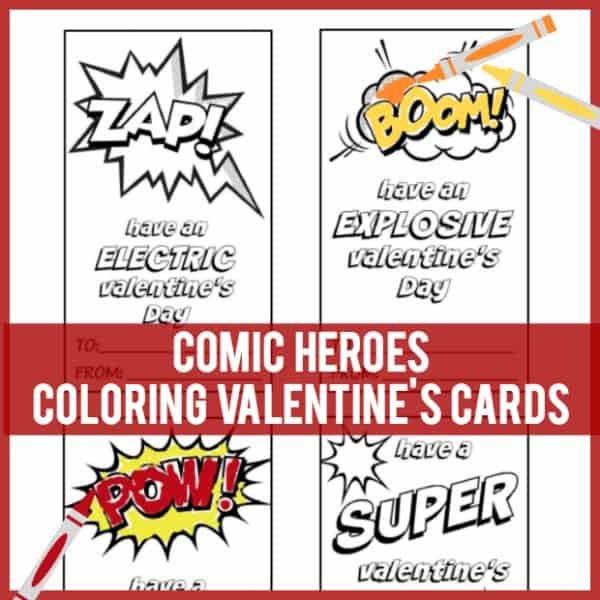 Well, I whipped up a bunch of free printable Comic Heroes Valentine’s Day cards that are perfect for last minute! This printable has four different cards on one sheet – just print them on cardstock or regular paper, cut them up and off you go! 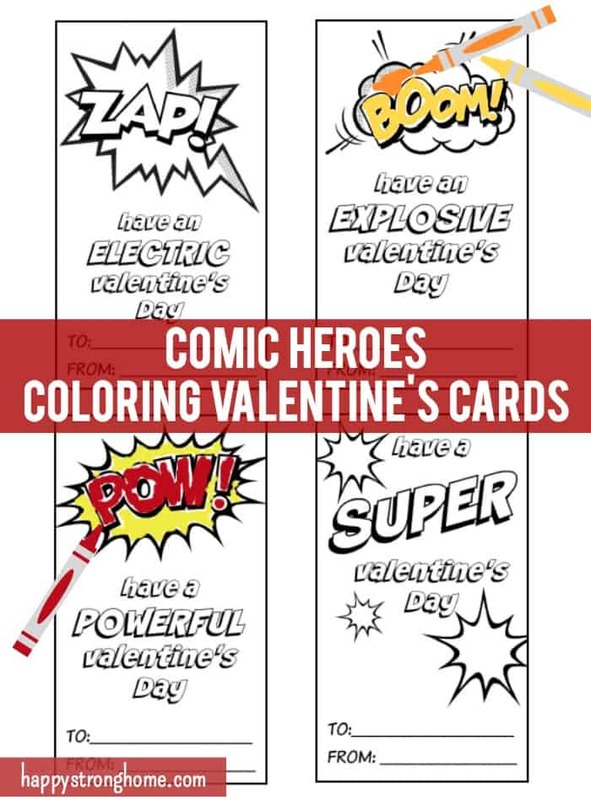 The Comic Heroes style features “sound effects” that are typical of classic comic strips with a funny little “Valentine’s” saying. Your child can choose to use all four styles or pick their favorites. You could have your child color and hand them out. Or, you could leave them uncolored and tie on a fun crayon, marker, or pencil to give as a little activity gift! Either way, it couldn’t be simpler to get yourself some last minute Valentine’s Day cards for your kids! Or even if you just wanted a coloring activity for at home. Looking for more Valentine’s Day fun!? If you’re looking for more fun Pop Art Valentine’s Day Cards, check out these printable Valentine’s Day Cards I shared in a previous post! Or this “Write” Friend Printable Valentine’s Card + Gift idea. How about some Valentine’s Day DIY Playdough? You could have kids make a candy and treat shop with this idea. Create a Valentine’s Sensory Bin for little ones. Make a Valentine’s Day Layered Dessert with this easy recipe. Download these Valentines’ Day Love Notes from God graphics for you to use on social media. How do you make Valentine’s Day fun for your kids? Cute and I love that it is black and white printer friendly too.